Gout is a disorder of purine metabolism characterized by elevated uric acid levels with deposition of urate crystals in joints and other tissues. 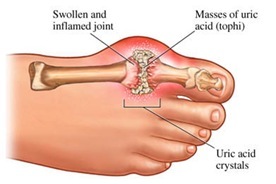 High uric acid levels result from decreased excretion of uric acid ( 90% of cases) due to a wide variety of causes. The disorder may progress from an asymptomatic stage through acute gouty arthritis, to chronic tophaceous gout. Complications include erosive deforming arthritis, uric acid kidney stones, and urate nephropathy caused by hyperuricemia.